Pumps are often noisy an effective solution is often required to suppress the noise emitted from them. Pump noise is usually a nuisance because they are sitting on comparatively lightweight structures. The best way to soundproof and to reduce any noise from a pump regardless of size is to enclose it within a Floor Mounted 4-Sided Soundproofing Acoustic blanket Enclosure. For best results the enclosure should be as large as possible to allow less heat buildup and also to be more effective at reducing the noise output from reaching other areas and acoustically isolating the pump to contain structure borne sound being transmitted from where it is mounted. Depending on the current sound levels of the pump and your noise reduction goals, an abatement solution can be determined. 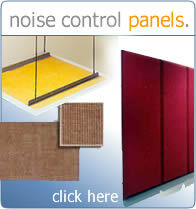 In most applications a soundproofing acoustic blanket enclosure will meet your sound reduction needs. This is a two to four sided enclosure with or without a roof. Typically a frame and track is constructed to suspend the sound curtain panels. The soundproofing blankets material is a composite material bonding mass loaded vinyl with an acoustical absorber and faced with a vinyl diamond stitched facing. Using our Soundproofing Blankets to construct a 4-sided noise control solution will significantly reduce sound. The noise reduction to be expected is a range of 20 to 40 decibels. The better the construction, weight of blankets and amount of soundproofing acoustic blankets used (the surface area) all factor into your sound reduction numbers. Ensuring all corners and edges are tight and that there are no gaps is a major factor. The size of the blankets in which the amount of surface area that is available to dissipate and contain the noise is the other major factor. Our Soundproofing Acoustic Blankets come standard with grommets across top, mating Velcro along the vertical edges and corner seals. 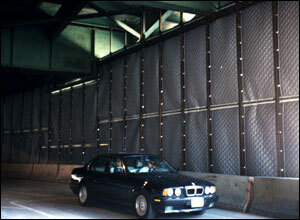 Soundproofing Blankets solve virtually all noise control issues. Read our case studies page to learn more about real world applications. Be sure to check out our partial client list here.